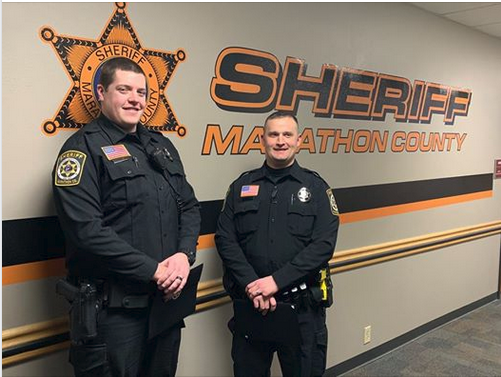 Tonight Deputy Adam Johnson and Deputy Nathan Olig were recognized for their actions on December 8, 2018. On December 8, 2018 Deputy Olig was dispatched to a report of a single vehicle crash at the intersection of Eagle Avenue and Oriole Lane in the Town of Rib Mountain. Upon arrival, Deputy Olig found a vehicle had driven through the T-intersection and struck a large tree. Deputy Olig located the sole occupant and driver of the vehicle who was semi-conscious and trapped in the driver’s seat. While assessing the driver’s injuries he noticed the vehicle was on fire near the engine compartment. Deputy Olig recognized the need for immediate action as the fire was growing. Due to his injuries the driver was unable to assist Deputy Olig in his own rescue. Deputy Olig struggled to free the driver’s trapped legs which were pinned between the seat and dashboard. Through great effort, Deputy Olig was able to free the driver and remove him from the vehicle just moments before it became fully engulfed in flames. Deputy Olig, recognizing that he and the driver were still in danger pulled the motorist further away from the burning vehicle and rendered aid. Deputy Johnson arrived a short time later and assisted Deputy Olig with stabilizing and rendering medical aid to the motorist. Temperatures at this time were approximately 19 degrees and the ground was frozen. Deputy Johnson and Olig continued to monitor and treat the motorist with the equipment they had available to them. Firefighters that arrived on scene had to focus their attention on the fire which delayed and prevented medical intervention due to the instability of the scene, making the efforts of Johnson and Olig all the more important. We are proud and blessed to have both of you as members of our Office.